Rapper 2 Milly yesterday revealed he was suing Epic Games, the creators of Fortnite, for copying his dance, the Milly Rock, in one of their emotes. The problem, he says, is not just that he’s not being fairly credited and compensated — it’s that he’s just one of several artists who’ve been treated this way by the game company. In the complaint filed by 2 Milly’s (real name: Terrence Ferguson) lawyers in a California court, they allege that Epic Games ripped off several artists, saying, “Epic has consistently sought to exploit African-American talent in particular in Fortnite by copying their dances and movements.” The complaint goes on to cite six different instances of this, including the Milly Rock. Listen, I understand where certain people are coming from but this is straight dumb. How are you going to sue Epic for "stealing" a noncopywrited dance but you dont sue all the rappers who used the dance physically and/or verbally in their music? 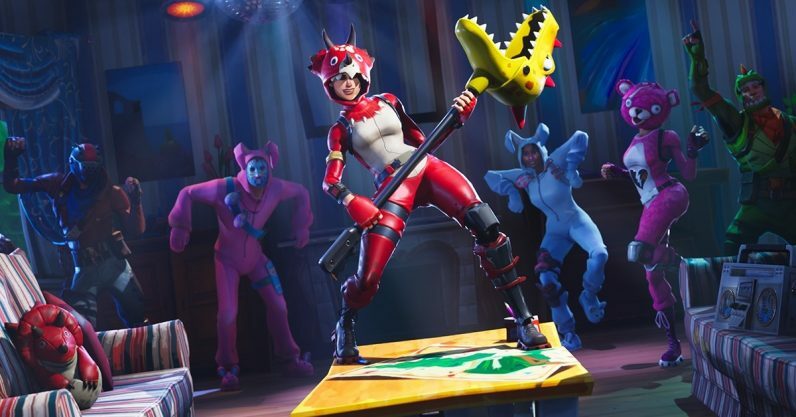 It’s not the first time someone has accused Fortnite of skimming from the talent of artists without crediting them. Back in July, Chance the Rapper suggested the emotes should be accompanied by the music of the person who popularized them, just so they would have some form of credit. The discontent over the issue bubbled for some time, though it did nothing to put a dent in Fortnite‘s runaway success. Rumors about 2 Milly in particular pursuing legal action have been cropping up since September, but he’s far from the only one who’s unhappy. Also, while it’s not exactly clear who created the “Orange Justice” dance, Roy Purdy, the dancer who popularized it, said on Twitter he wasn’t credited either. Epic uses the Milly Rock, and other dances, to create the false impression that Epic started these dances and crazes or that the artist who created them is endorsing the game. Indeed, players have posted thousands of videos of themselves performing the “Swipe It” emote with the hashtag #fortnitedance, without referencing the Milly Rock or crediting Ferguson as the dance’s creator and owner. Accordingly, upon information and belief, Epic actively and knowingly directs, causes, induces, and encourages others… to misappropriate Ferguson’s likeness and the Milly Rock dance. I do feel like Chance was very correct in what he said and that if you would have incorporated the song along with the dance title ‘MillyRock’ in Fortnite instead of not using the record and changing the name to the “swipe it” stealing away from my artwork then I’d might be ok with it if we worked out some type of agreement…I just feel like the appropriate thing to do is compensate me with a fair amount for my addition to the game. I’m not actually trying to sue for the whole game. Whatever they made off Season 5, off that “Swipe It” emote, that’s what I’m searching to get fair compensation on. That only. They took my craft, and they sold that… I don’t wanna ruin kids’ lives. The game is for the kids. But just the fact, the way they did it — that’s not business. I think it should be taken out. I hope 2milly get his bread. Just so all these internet paralegals can get even madder. A rep for Epic Games declined to comment on this story.